The US has historically funded infrastructure development through states and cities but while the need for infrastructure investment has been increasing, public sector funding has been declining over the last several decades. Current federal systems for funding infrastructure investment also make it difficult for cities and states to leverage private financing to modernize and ensure the longevity of infrastructure systems. Private financing is a valuable tool for cities to address the challenge of rebuilding aging, undersized and failing infrastructure systems. The Federal Government can create mechanisms, like a National Infrastructure Bank, to help ensure a robust private sector role in city infrastructure investment. Currently, the delivery system for infrastructure financing is inadequate. The use of private financing for infrastructure projects in the United States is not robust, in part because financing requires a revenue stream to pay back the loan. Infrastructure service fee structures do not account for the full cost of service, repair and maintenance and thus, in too many cases, private investors do not deem these projects to be financially prudent. Financing is also particularly challenging for cross-sector and multi-benefit projects, since there is no single structure allowing for government dollars to leverage private capital. Federal funding and financing flow from sector-specific, programs such as the State Revolving Funds for water, or the Highway Trust Fund and TIFIA for transportation. This system limits opportunities to design and construct innovative infrastructure projects that provide multiple public benefits, such as green infrastructure projects in transportation improvements, and multi-modal transportation projects that can improve public health, increase community connectivity, and increase land values, among other benefits. When combined, these multi-benefit projects have the potential to be financed through multiple revenue streams like user fees, taxes flowing from increased land values, losses avoided, and tolls. This value, however, is often lost because projects are funded through programmatic silos, and cities struggle to piece funds together from different programs with varying spending deadlines. To meet their infrastructure investment needs, cities need an efficient mechanism to complement public funds with private sector dollars. Such a mechanism should ensure that investments are made in a way that addresses current needs as well as future risks. By creating a National Infrastructure Bank (NIB), Congress could enable private sector investment to rehabilitate and enhance the resilience of infrastructure. 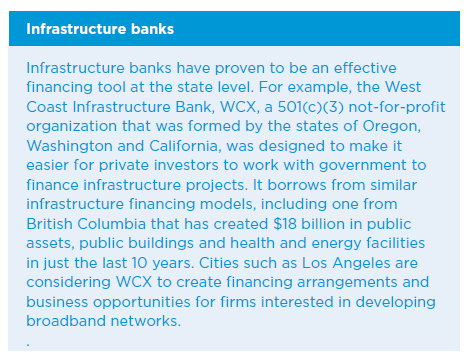 Infrastructure banks are often capitalized by public sector dollars, with public sector money then lent to state and local governments at below market rates to attract private loans, or loan guarantees for infrastructure projects that provide a clear public benefit. Revenues generated from the projects are then used to repay the loan and recapitalize the bank to fund other projects. as the Highway Trust Fund and State Revolving Funds) and provide financing options for a variety of infrastructure projects (e.g., energy, water, transportation, communications). Are designed to account for future conditions over the project’s design life to ensure the long-term viability of the investment. Redevelop and rehabilitate existing “brownfields” infrastructure before financing new infrastructure in “greenfields” (or undeveloped areas). Meet specific criteria related to a project’s return on investment and provide other economic, environmental, and social benefits such as economic growth in economically disadvantaged communities and job creation for low-income workers. Provide environmental, resilience and economic benefits, such as green infrastructure, land acquisition and restoration projects. Allow NIB funds to be blended with funds from other funding and financing programs like SRF, TIFIA, WIFIA. Facilitate a comprehensive range of financing options, including financial products that encourage private investment at various project stages, loan guarantees and other forms of risk mitigation and credit enhancement. Allow smaller projects to be bundled and prioritize projects that are cross-sectoral or that deliver multiple benefits (such as multimodal transportation or green infrastructure projects), as these types of projects face financing barriers under current federal funding structures. Allow borrowers to implement projects through special agencies and authorities, such as special purpose districts, utility districts and port authorities, to reduce any potential negative impact on municipal credit ratings caused by increased borrowing. Incorporate advice from finance industry leaders, including institutional investors, (re)insurance and credit rating agencies, to ensure market knowledge is embedded within the structure of the NIB, and to ensure the market is informed of the overall stabilization and growth created by modernizing and making resilient infrastructure. NIB can bring a great deal of value to many cities. For example, New York City’s almost partially funded $3.7 billion coastal protection plan calls for flood-protection infrastructure and ecosystem restoration to enhance the city’s flood resilience.42 Berkeley’s 5-year, $30 million initiative calls for street improvements and green infrastructure to address storm water management and other resilience objectives.43 These investments would not only help these cities enhance their resilience, but also create job opportunities and increased economic investment into local city economies by supporting goods procurement and support for service. Congress should create and capitalize a NIB to facilitate private financing for projects aimed at rehabilitating and modernizing infrastructure in cities and greater metropolitan regions. The expertise of leading infrastructure agencies should be sought in the design of the NIB to ensure that NIB financing can be blended with other public-sector dollars and financing mechanisms. Departments with leading roles in infrastructure funding and financing include the Department of Transportation, US Department of Agriculture with investments in rural communities, Department of Defense, Department of Energy and the Environmental Protection Agency.